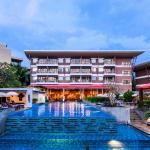 Set in a prime location of Phuket, Novotel Phuket Kata Avista Resort and Spa puts everything the city has to offer just outside your doorstep. The hotel offers a wide range of amenities and perks to ensure you have a great time. Facilities like free Wi-Fi in all rooms, 24-hour front desk, facilities for disabled guests, express check-in/check-out, luggage storage are readily available for you to enjoy. Guestrooms are fitted with all the amenities you need for a good night's sleep. In some of the rooms, guests can find television LCD/plasma screen, internet access - wireless, internet access - wireless (complimentary), non smoking rooms, air conditioning. Access to the hotel's hot tub, fitness center, sauna, outdoor pool, spa will further enhance your satisfying stay. For reliable service and professional staff, Novotel Phuket Kata Avista Resort and Spa caters to your needs.